Why doesn’t Oundle have a railway? Few people have any sympathy for the Beeching Axe, which dramatically reduced both freight and passenger rail services in Great Britain. But many of our inhabitants will be aware that Oundle did once have a railway station. Our line connected Peterborough with Northampton, and was an extension line of the London and Birmingham railway. The line had high operating costs, owing to a number of “manned level crossings”, and was in time just another constituent part of the Beeching Axes. Passenger services were suspended in 1964, against considerable public protest. There was a maintenance of freight services, which was defined very broadly, accommodating, for example, the considerable traffic at the beginning and end of Oundle School terms. In time, freight services were also degraduated, and the last rail service was a special railtour on November 4, 1972. The Beeching Axes were formulated according to the findings of Dr Richard Beeching, a member of the Board of Imperial Chemical Industries co-opted by the second Macmillan ministry to be Chairman of British Railways. He concluded that a significant proportion of British railways were highly unprofitable. Fifty percent of lines with below-average traffic supplied only two percent of revenue, and a third of the lines carried only one percent of passenger traffic. 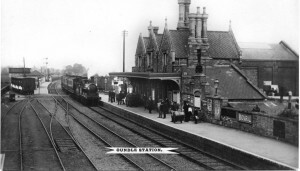 Dr Beeching felt that there was too much redundancy in the railway network, and that the right development and modernisation of the railways required a more convergent concentration of resources upon trunk routes. This would mean in practical terms that a conceptual passenger would only be able to get from A to B using one route. to utilise the trunk routes. In his own words: “The real choice is between an excessive and increasingly uneconomic system, with a corresponding tendency for the railways as a whole to fall into disrepute and decay, or the selective development and intensive utilisation of a more limited trunk route system.” His decision to axe lines was therefore very considerable, and when they were implemented they met fierce protest. However, the profits of the trunk routes, so far from being enhanced by increased streamlining, were generally speaking, dented by the axing of the branch lines. The replacement bus services instituted in many parts of the country were often unpopular for being slower, and they provided no service additional to that of the old railways, and as a result, many of these were axed in turn, leaving some regions without any public transport at all. Automobile users, meanwhile, now began to use their cars for long-distance journeys, and the main trunk routes lost further traffic. The cutting of branch services also reduced the viability of freight services, because the precision of the rail freight fell significantly below that of the average lorry. In fact, the axes made no appreciable improvement in the profitability of British Railways. Nowadays, it’s accepted that railways will have to be subsidised. This subsidy is widely considered to arise from the multilateral, pluralised investment enabled by privatisation, but of course the dramatic repudiation of state interest during the privatisation of the mid-1990s considerably increases the expense of any planned restoration of rail lines on old beds, because that would be due to private contractors, who would be engaged for significant development work in the absence of any real maintenance of old lines. This is true in Great Britain, where concessions to railway upkeep are in many ways less than those in the US, where there exists a “rail bank” to ensure that federal railways have full rights-of-way over their old lines, and can return them to functionality if needed within a year. The lack of a rail-banking policy in the United Kingdom, however, significantly increases railway re-creation costs for Network Rail. At any rate, the railway lines of the US are primarily used for freight traffic, and so considerations of popular customer service do not appear in the same way. As such, there are no immediate plans for a reconstruction of the old line from Peterborough to Northampton, or any service to Oundle. The publicity officer of the Nene Valley Railway, Jerry Thurston said: “It would be brilliant if the NVR went as far as Oundle, but whether it would be practical is another matter”.